Colton T-Ball held Opening Ceremonies on Saturday, Apr. 6 at McKinley Park. families and loved ones were in attendance to share the excitement for the upcoming year. With 14 teams and about 150-plus players signed on to participate, Colton T-Ball expects a very competitve and fun-packed year for the kids. pline and also create a fun environment for the kids while learning multitude of skills that carry on past this division.” It was evident with the parents T-Ball, cont. on next pg. 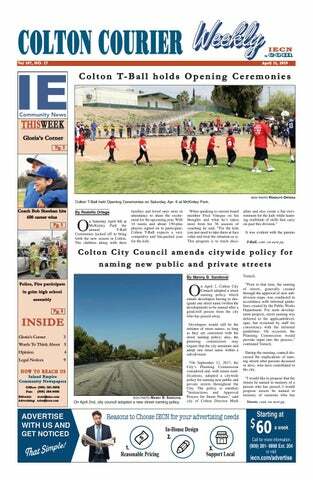 n April 2, Colton City Council adopted a street naming policy which entails developers having to designate one street name (within the development) to be named after a good-will person from the city who has passed away. On April 2nd, city council adopted a new street naming policy. During the meeting, council discussed the implications of naming streets after persons deceased or alive, who have contributed to the city. “I would like to propose that the streets be named in memory of a person who has passed. I would propose streets be named in memory of someone who has Streets, cont. on next pg. ficials and practicing planners to learn more about careers in public service. Community college students or high school juniors and seniors who live in the counties of Imperial, Los Angeles, Orange, Riverside, San Bernardino or Ventura are eligible to apply. The due date for applications is April 26. Please visit www.scag.ca.gov/scholarship for application materials and additional details about the program. the sport but know that there are more important lessons that can be learned to be taken with them for the future. It’s also important for him to teach the game to the kids so the integrity of the sport stays true. Colton T-Ball carries a strong image and is respected by many as its foundation is the concept of family. There is a reason this league has lasted as long as it has – it’s been and continues to be managed by people who care about what’s most important, and that’s the kids. opportunity to lead debate in the US House of Representatives, and to preside over the chamber as we discussed such an important priority. I’m proud to have the opportunity to represent the community that raised me in Congress, and I was especially proud today,” said Aguilar. Aguilar serves as a Chief Deputy Whip in the House Democratic Caucus, Whip of the New Democrat Coalition, and is the Vice Chair of the House Appropriations Committee. Submit your photos for publication - sports, birthdays, anniversaries, events to editor@iecn.com for consideration. Correction A correction to the article “Cesar Chavez memorial celebration brings inspiration to Inland Empire” that ran on Thursday, Apr. 4 - in the article it erroneously stated that the event was hosted by Assemblymember Eloise Gomez Reyes, when in fact it was hosted by LEAD (Latino Education & Advocacy Days), with the Chicano Latino Caucus of San Bernardino County as the principal organizer. Assemblymember Reyes was the event emcee. Inland Empire Community Newspapers • Apr. 11, 2019 • Page A3 Training from 9:00 a.m. to 12:00 p.m. at its facility, 374 W. Orange Show Rd. Because the rattlesnake season has been starting earlier, it is recommended that all dogs be trained to avoid rattlesnakes. In addition to training a rattlesnake vaccination is recommended which is available at $26. Rattlesnakes in our area are not only on hiking trails but in backyards. For information or to Theatre: pre-register your pet call (909) 386Now - Sunday, April 28 - Life- 1400 ext 218 or 244 or at the house Theater presents an amazing Human So jetty Office during norjourney, “Pilgrim’s Progress,” at mal business hours. 1135 N. Church Street, Redlands. Based on the classic by Bunyan, Now to April 28 - UCR ARTS: this musical follows Christian on California Museum Of Photograhis journey encountering angels, phy and the Riverside Art Museum devils, and giants. Performances are present “In the Sunshine of NegFridays at 7:00 p.m., Saturdays and lect: Defining Photographs and Sundays at 2:00 p.m. For ticket and Radical Experiments in Inland general information call (909) 335- Southern California, 1950 to the 3037 or online at Present”. This exhibit runs simulwww.boxoffice.lifehousetheater.co taneously at the two museums m. which are three blocks apart. The Riverside Art Museum is located at Reading Programs: 3424 Mission Inn Ave. The show Now - April 13 - the San presents the Inland region on the County Library eastern edge of Los Angeles as an Bernardino Branches in cooperation with In-N- experimental tabula rasa playOut Burger present the Cover to ground for photographers where Cover Reading Club. Any child nothing was at stake, so everything between the ages of 4 and 12 are el- was possible. The exhibit includes igible to participate. Children un- 194 works by 54 photographers. able to read may participate if For museum hours and further inparent reads with the child. For formation and for purchase of comevery five books read, the child will plete catalogue call (951) 684-7111 receive a Cover to Cover Achieve- or visit ment Award good for a free ham- www.riversideartmuseum.org. burger or cheeseburger. Each child may ear up to three award certifi- Save the Date: cates during the program . To participate a child must signup at any Friday, April 12 - the American San bBernardino County Library Association Of University Women Branch. Library staff will provide (AAUW) and Zonta Club Of Redinformation. There are two in our lands present A Lunafest Film Fesimmediate area: Rialto Branch, 251 tival from 5:30 to 9:00 p.m. at Esri, W. 1st Street and San Bernardino 380 New York Street, Redlands. County Library, 25581 Barton This traveling fundraising film fesRoad, Loma Linda. Visit sb- tival is dedicated to promoting county.gov for other branches in awareness about women’s issues, outlying areas. highlighting women filmmaker and bring women together in their comThursdays, now to June 27 - the munities. Tickets may be purchased Young Readers’ Room, A.K. Smi- at the door. ley Public Library presents Tiny Tots Story Time (Ages 2-3) from Saturday, April 13 - the West 10:15 to 10:30 a.m. and 10:40 to Valley Water District presents Cel10:55 a.m. at the library, 173 S. Eu- ebrate Earth Day from 10:00 a.m. reka Street behind the Lincoln Me- to 1:00 p.m. This kid friendly event morial Chapel. No registration is features activities, tours, demonstraneeded. For information call: (909) tions and free food and much more 798-7674. for families. The West Valley Water District is located at 855 W. Base Exhibits, Workshops, Classes: Line Rd., Rialto Saturday, April 13 - California State University, San Bernardino’s University Diversity Committee and Westside Action Group present Symposium on Race Relations and Social Justice: Dismantling Systems Of Racism and Exclusion for a Better I.E. Registration starts at 8:00 a.m. with program running from 9:00 a.m. to 3:00 p.m. Keynote speaker is Dr. Gail C. Christopher who will discuss racial healing and the social determinants of health and well being. Many breakout session topics on homelessness, education, criminal justice, and leadership and other community issues. To register and information visit http://library.csusb.edu/Symposium/. or call Robie Madrigal (909) 537-5104 or email rmadrigal@csusb.edu. Saturday, April 13 - the 7th Annual Riverside Tamale Festival will be held from 11:00 a.m. to 7:00 p.m. at White Park, 3936 Chestnut Street. This family friendly event features food, live music and entertainment. For information visit www.rivtamalefest.com This event supports the preservation of the Trujillo Adobe. Community Services presents Easter Egg Hunt & Earth Day Celebration from 10:00 a.m. to 1:00 p.m. at Veterans Park, 290 East O Street. This free event features Egg Hunt areas for children 0-12 in the ball field. Free BBQ for the first 200 guests and a Bike raffle are among the activities for the day. For vendor information call Melanie (909) 370-5569 or email msanchez@coltonca.gov for candy and egg sponsorships email hstrutz@coltonca.gov. Saturday, April 20 - the City of San Bernardino Parks, Recreation & Community Services presents Eggstravaganza at 2:30 p.m. at Lytle Creek Community Center, 380 S. K Street. This event features games, food, crafts and egg hunts. For information call (909) 3844524 or visit www.sbcity.org/parks. Saturday, April 20 - the City of San Bernardino Parks, Recreation & Community Services Department present Spring Eggstravanza Hunt from 12:00 to 4:00 p.m. at the Rudy C. Hernandez Community Center, 222 N. Lugonia Ave. This event features crafts, games prizes and egg hunt. For information call (909) 384-4524 or visit www.sbcity.org/parks. Saturday, April 20 - Young Visionaries VIP Community Outreach and Engagement presents Easter Family Day at the Park from 10:00 a.m. to 3:00 p.m. at Perris Hill Park. This free event is open to the community and features an Easter Egg Hunt, Music, Free Food and Jumpers for the Kids. Favorite Quote: “The indigenous people around the world, before they made a major decision, used to ask themselves, How does this decision affect our people seven generations ahead?” - Jane Goodall To submit an event or information for Gloria's Corner please email: gloscalendar@gmail.com. Deadline is 12 p.m. each Friday. 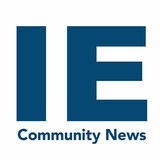 COMMUNITY COMMENTARY You can email letters to editor@iecn.com. Please include your name and city of residence. Anonymous letters will not be printed. Tax Day of fers small business tax relief more jobs. For example, Peabody Engineering, a small business located in Corona, has responded to the tax reform by increasing its workforce and raising wages. While checking in with Peabody CEO Mark Peabody he noted that â&#x20AC;&#x153;as a result of the Trump Tax Cuts, Peabody Engineering has enjoyed a strong spike in revenues, with record sales in 2018 due to the strong and growing economy. We increased our workforce by approximately 20% and were able to give across the board pay increases of 4.1% to every employee. We look forward to continued growth in 2019 and beyond because of the massive move toward less crippling government regulation and increased demand for our products due to the spike in domestic manufacturing.â&#x20AC;? The company is now looking to the future. It is investing in new equipment and committing more capital to research and development of new products. The booming economy is also paying off for American workers who are seeing more money in their pockets. Hourly wage growth is exceeding 3% for the first time in almost a decade. With the strong economy, there has never been a better time to start or grow a business. Whether entrepreneurs need access to capital, business counseling, or help breaking into international markets, the SBA has the resources to help. I encourage small business owners interested in taking advantage of the new tax laws to work with their tax professionals to see if their business qualifies for important deductions. T he gift of life Have you ever seen the beating heart of a beautiful gift of life? I have, it was my son, he was only in my womb 18 days and had a visible heart beat. I had two miscarriages before his birth which were devastating to me and my husband after trying to have another baby 6 years after the birth of our daughter who almost died at birth. I was going to a fertility specialist at the time. As my doctor was moving the ultrasound wand around we both suddenly saw the heart beating. He had tears in his eyes as he said â&#x20AC;&#x153;you made my day.â&#x20AC;? I am sharing this personal experience so you will know life is precious and the baby in the womb is a living being given to us by our LORD above. Our son was born as is spoken in Psalm 139:13-16 For you created my inmost being; you knit me together in my motherâ&#x20AC;&#x2122;s womb. I praise you because I am fearfully & wonderfully made... He is now 29 yrs old and served in the Marines for 5 years and currently has a career that he loves. He will be asking his love to marry him this month. Whatâ&#x20AC;&#x2122;s the ultimate form of human idiocy? I nominate religious suicide bombings, in which fanatics kill themselves to murder â&#x20AC;&#x153;infidelsâ&#x20AC;? of rival faiths or no faith. What type of insanity makes some fervent believers think theyâ&#x20AC;&#x2122;re serving God by slaughtering defenseless strangers who did them no harm? Are these killers totally devoid of human compassion? Can they look at surrounding people and families with no reaction except a desire to murder them? Do they really think that God wants massacres, and will reward them with virgins in paradise after they sacrifice their own lives? Itâ&#x20AC;&#x2122;s lunacy â&#x20AC;&#x201C; yet itâ&#x20AC;&#x2122;s a daily reality of modern times, perhaps the single worst source of bloodshed since the Cold War ended. Itâ&#x20AC;&#x2122;s so absurd that it couldnâ&#x20AC;&#x2122;t possibly happen â&#x20AC;&#x201C; but it happens almost every day. and 5,160 wounded. Many attacks involved two or more â&#x20AC;&#x153;martyrs.â&#x20AC;? Surprisingly, the number of women suicide volunteers has grown until they now constitute about one-fifth of the killers. For years, I wished that the available supply of suicide volunteers would kill themselves off and the phenomenon would cease. But there seems to be an endless parade of new zealots eager to become â&#x20AC;&#x153;martyrs.â&#x20AC;? Various experts attribute the â&#x20AC;&#x153;cult of deathâ&#x20AC;? to political, sociological, economic or psychological causes. Maybe theyâ&#x20AC;&#x2122;re partly correct â&#x20AC;&#x201C; but the glaring fact remains that religion underlies the ghastly, incomprehensible, maddening mess. Pundit Anthony Lewis wrote: "There is no way to reason with people who think they will go directly to heaven if they kill Americans." Columnist William Safire said the volunteers do it because their "normal survival instinct is replaced with a pseudo-religious fantasy of a killer's self-martyrdom leading to an eternity in paradise surrounded by adoring virgins." Columnist David Brooks wrote that the bizarre phenomenon is "about massacring people while in a state of spiritual loftiness." Normal people cannot understand why some fanatics kill themselves to commit atrocities. But, understandable or not, it's a deadly daily reality. James Haught, syndicated by PeaceVoice,is editor emeritus of West Virginiaâ&#x20AC;&#x2122;s largest newspaper, The Charleston Gazette-Mail. Words to Think About: Never too late to develop marketable skills With a wife and three children he needed to find a job. In assessing his situation, he knew he needed a short-term plan and a long term one. A natural salesman, he went into insurance and then into selling stocks and bonds. For the long term he went to graduate school for more education. He became a high school teacher and administrator. ecently a friend gave me a provocative adage. DEVELOP MARKETABLE SKILLS. This is particularly meaningful in this time of economic woes and job instability. Its meaning is clear. Working people should develop optional skills. Have more than one way to make a living. When my friend was fifty years old he lost his job after twentyeight years. He had been in a highly specialized vocation. He wrote two best selling books and started a business. He says, “When I was fired years ago, I vowed that never again would I be caught with limited skills. DEVELOP MARKETABLE SKILLS. Wisdom is vital for our economic future. No one knows how permanent our jobs are. Every current vocation is fragile at best. The key word is MARKETABLE. Basically, it means a job that will bring income. I’ve met several college graduates recently who can’t find a job. Their education has been in non-marketable skills. pist and takes her chair to business offices. She makes an excellent living. Wayne is a retired veteran (78). After retirement he went to work for San Bernardino city; became a lawyer and a judge. Marketable skills. Homer is also an ex-military retiree. He became a fireman, an electrician and a manager of theaters. He possesses marketable skills. Jeff is 52 years old. He’s been a cook, manager of a fast food and manager of a picture framing business. He’s been in charge of maintenance in a large mall. He can do plumbing, electricity and carpentry. Marketable skills. If I was a young man today, I would survey the job market for those that are doable and durable. Like barbering, bartending, auto mechanic. These are “service” vocations and are certainly marketable. The biggest excuse I’ve heard about learning a new skill is simple. “I’m too old to learn a new skill.” I never buy it. I recently read about a bull that thinks he’s a horse. He has become a show-jumping sensation. Sabine Rovas is a horse trainer from Strasbourg. She adopted Aston (the bull) about five years ago from a dairy farm. She soon noticed Aston watching practice sessions with a pony named Samy. So she started training the 1.3-ton horned male cow. He trots, gallops, walks backward, turns on command and leaps over a 4-foot obstacle. She even rides Aston like a horse. He is now in show business. If a bull can learn something new, well? Stella and I have a grandson named Jordan. He has a dog that cannot hear. He’s teaching his dog to read sign language. When he makes the sign to sit, the dog obediently sits. His dog responds to other signs. I ask you, if a bull and a dog can learn a new skill? What about a marketable skill? Amen. Selah. So be it. at Arrowhead Christian Academy, Costa Mesa High School, and, more famously, at Chino High School for 27 of his 37 years as a coach. Chino is where Sheehan collected the majority of his wins (482 to be exact) and the baseball field at Chino is now named after him. ily, including me, came up and took some pictures to help remember this once in a lifetime moment. I personally have enjoyed seeing many, many of these 600 wins and it is so cool to know I have a grandpa who is one of the best high school coaches out there. Good luck to Beaumont the rest of the season as they and Sheehan look to add a few more to that 600 win count. Above: Caden with his grandfather Bob Sheehan who celebrated his 600th career win last Saturday. Left: Beaumont High School Baseball Team. ation Now, the Sierra Club My Generation Campaign, the Inland Congregations United for Change, and the Riverside-San Bernardino County Indian Health Inc.
to grow the movement for a more safe, cleaner, and healthier community.”During the event residents will have the opportunity to learn about gardening, produce their own art, and watch live performances from local musicians. The first 100 people in attendance will receive free tacos. Food will also be sold throughout the event. Local businesses Tacos Don Ramon, Viva La Boba, the Downtown Fit Camp, and Juan Pollo have committed to be sponsors for the event. For more information, follow Earth Vibes on Facebook, Instagram, and Twitter. New location at 25825 Redlands Blvd. in Redlands will serve both pediatric and adult patients. ment by 50 percent. The grant will also sponsor two enrollment and outreach coordinators focused on building a pipeline from all high schools statewide to CSUSB, other California State University campuses or a University of California campus. For more information on the Native American Speaker Series visit https://inside.csusb.edu/node/2168 6. Redlands Fire Captain Josh Hannan, Engineer Brent Fuller and Firefighter/Paramedic Bradford Williams work to extricate passengers from the damaged vehicle following a mock drunk driving accident, part of the Every 15 Minutes program at Redlands High School. drunk driver who struck two teen pedestrians on Central Avenue, behind Redlands High School. As students in bleachers watched the tragedy unfold, firefighters extricated victims from the wrecked vehicle, and treated the two pedestrians, including one who was pronounced “dead” on the scene and taken away in a coroner’s van. The second victim was airlifted by a Mercy Air helicopter from the field at the high school stadium. In the scenario, she also “died” at the hospital. A passenger in the car was transported by American Medical Response ambulance. Redlands Police Officer Matthias Knudsen places the driver of the vehicle under arrest following a mock drunk driving accident, part of the Every 15 Minutes program at Redlands High School. Redlands Police Officer Dale Peters checks on a pedestrian who was “struck and killed” by a vehicle during a mock drunk driving accident, part of the Every 15 Minutes program at Redlands High School. 01/01/2014 By signing, I declare that all information in this statement is true and correct. A registrant who declares as true information, which he or she knows to be false, is guilty of a crime. (B&P Code 17913). I am also aware that all information on this statement becomes Public Record upon filing. s/ MICHAEL D SKIDMORE Statement filed with the County Clerk of San Bernardino 3/12/2019 Notice- In accordance with subdivision (a) of Section 17920, a fictitious name statement generally expires at the end of five years from the date on which it was filed in the Office of the County Clerk, except, as provided in Subdivision (b) of Section 17920, where it expires 40 days after any change in the facts set forth in the statement pursuant to Section 17913 other than a change in the residence address of a registered owner. A new fictitious business name statement must be filed before the expiration. The filing of this statement does not of itself authorize the use in this state of a fictitious business name in violation of the rights of another under federal, state, or common law (see Section 14411 Et Seq., Business and Professions Code). Published 3/28,4/4,4/11,4/18/19 Published in Colton Courier C-8138 Fictitious Business Name Statement FBN No. 2019-0003005 The following person(s) is (are) doing business as: NHSIE REALTY, 1845 S BUSINESS CENTER DR, #120, SAN BERNARDINO, CA 92408 NEIGHBORHOOD HOUSING SERVICES OF THE INLAND EMPIRE, INC, 1845 S BUSINESS CENTER DR, #120, SAN BERNARDINO, CA 92408 Inc./Org./Reg. No. : C1038471 State of Inc./Org./Reg. : CA This business is conducted by (a/an): CORPORATION The registrant commenced to transact business under the fictitious business name or names listed above in 06/15/2012 By signing, I declare that all information in this statement is true and correct. A registrant who declares as true information, which he or she knows to be false, is guilty of a crime. (B&P Code 17913). I am also aware that all information on this statement becomes Public Record upon filing. s/ DAWN M. LEE Statement filed with the County Clerk of San Bernardino 3/12/2019 Notice- In accordance with subdivision (a) of Section 17920, a fictitious name statement generally expires at the end of five years from the date on which it was filed in the Office of the County Clerk, except, as provided in Subdivision (b) of Section 17920, where it expires 40 days after any change in the facts set forth in the statement pursuant to Section 17913 other than a change in the residence address of a registered owner. A new fictitious business name statement must be filed before the expiration. The filing of this statement does not of itself authorize the use in this state of a fictitious business name in violation of the rights of another under federal, state, or common law (see Section 14411 Et Seq., Business and Professions Code). Published 3/28,4/4,4/11,4/18/19 Published in Colton Courier C-8139 Fictitious Business Name Statement FBN No. 2019-0003006 The following person(s) is (are) doing business as: ONE TOUCH PHOTO BOOTHS, 18094 TANZANITE RD, SAN BERNARDINO, CA 92407 CHRIS BROWN, 2686 W MILL ST, SP 17, SAN BERNARDINO, CA 92410 JESSICA BROWN, 2686 W MILL ST, SP 17, SAN BERNARDINO, CA 92410 This business is conducted by (a/an): MARRIED COUPLE The registrant commenced to transact business under the fictitious business name or names listed above in 10/21/2013 By signing, I declare that all information in this statement is true and correct. A registrant who declares as true information, which he or she knows to be false, is guilty of a crime. (B&P Code 17913). I am also aware that all information on this statement becomes Public Record upon filing. s/ CHRIS BROWN Statement filed with the County Clerk of San Bernardino 3/12/2019 Notice- In accordance with subdivision (a) of Section 17920, a fictitious name statement generally expires at the end of five years from the date on which it was filed in the Office of the County Clerk, except, as provided in Subdivision (b) of Section 17920, where it expires 40 days after any change in the facts set forth in the statement pursuant to Section 17913 other than a change in the residence address of a registered owner. A new fictitious business name statement must be filed before the expiration. The filing of this statement does not of itself authorize the use in this state of a fictitious business name in violation of the rights of another under federal, state, or common law (see Section 14411 Et Seq., Business and Professions Code). Published 3/28,4/4,4/11,4/18/19 Published in Colton Courier C-8140 Fictitious Business Name Statement FBN No. 2019-0003007 The following person(s) is (are) doing business as: PAWS AND JAWS, 15664 MAIN ST. SUITE 170, HESPERIA, CA 92345 LACY E WEIFORD, 16066 OSAGE RD, APPLE VALLEY, CA 92307 This business is conducted by (a/an): INDIVIDUAL The registrant commenced to transact business under the fictitious business name or names listed above in 01/07/2014 By signing, I declare that all information in this statement is true and correct. A registrant who declares as true information, which he or she knows to be false, is guilty of a crime. (B&P Code 17913). I am also aware that all information on this statement becomes Public Record upon filing. (909) 384-0406 FBN’s ONLY $40!